Your veins, which carry blood from various parts of the body back to your heart, play a vital role in your circulatory system. As you age, however, problems can develop in the veins, and these, in turn, can lead to various complications. If you suspect that you have vein disease in Battle Creek, your best course of action is to seek a healthcare provider for vein treatment. Although vein disease in Battle Creek is very common and manageable, it could lead to potentially dangerous complications if left untreated. Individuals who are overweight, pregnant, older, physically inactive, or have a family history of varicose veins have a higher risk of developing vein disease in Battle Creek. So, if you fit any of these criteria, you may benefit from undergoing an evaluation for vein disease in Battle Creek. 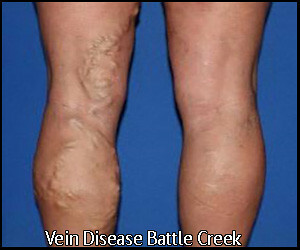 What Is Vein Disease in Battle Creek? Unlike in other medical conditions, you may experience very subtle signs and symptoms in the early stage of vein disease in Battle Creek. In fact, most people who have vein disease in Battle Creek usually aren’t aware that they have the condition because it can present itself in many different ways. In order for you to recognize that you need vein treatment, you must first understand the different symptoms of vein disease in Battle Creek. One of the most common symptoms associated with vein disease in Battle Creek is the appearance of varicose or spider veins in the leg area. Varicose Veins – This symptom of vein disease in Battle Creek occurs when vein walls are weak and valves do not close properly. Varicose veins are dilated and can bulge under the skin. Spider Veins – Much like varicose veins, spider veins are also dilated blood vessels in the skin. However, this symptom of vein disease in Battle Creek is usually much smaller in diameter and tends to be purple or red in color. At Restorative Health Care, we have been a leader in the treatment of varicose veins and vein disease in Battle Creek since the 1990s. Our doctor is trained in all aspects of vascular surgery and focuses his practice on the treatment of vein disease in Battle Creek. We offer free vein disease screenings as well as effective vein treatments. If you’re uncertain about whether the symptoms you’re experiencing are caused by vein disease in Battle Creek, get in touch with us. We offer free vein evaluations. Our goal is to help our patients know for sure whether they have vein disease. Battle Creek residents who turn to us will have to undergo a venous duplex ultrasound exam and meet with our physician assistant to discuss their symptoms. Restorative Health Care provides a variety of treatment options for patients with vein disease. Battle Creek residents can choose the VenaSeal TM Closure System, a treatment which improves the blood flow by sealing the diseased vein. They can also opt for endovenous laser ablation, sclerotherapy, microphlebectomy, and more. As soon as you spot signs of vein disease in Battle Creek, reach out to the professional team at Restorative Health Care. Consult our healthcare provider, and find the most effective treatment for vein disease in Battle Creek! Click here to learn more about our vein treatment.